“What a bloody, one-sided battle this was. It was simply murder . . . . They melted like snow on the ground, one officer said—wave after wave of Federal soldiers charging uphill across an open, muddy plain. Confederates, fortified behind a stone wall along a sunken road, poured a solid hail of lead into them as they charged . . . and faltered . . . and died. As a result of the carnage, the Battle of Fredericksburg is usually remembered as the most lopsided Union defeat of the war. “Burnside’s folly,” it’s been called—named after the Union commander Maj. Gen. Ambrose Burnside who led the Army of Potomac to ruin along the banks of the Rappahannock River. But the Battle of Fredericksburg remains one of the most misunderstood and misremembered engagements of the war. Burnside started with a well-conceived plan and had every reason to expect victory. How did it go so wrong? Authors Chris Mackowski and Kristopher D. White have worked for years along Fredericksburg’s Sunken Road and Stone Wall, and they’ve taken thousands of visitors across the battlefield. 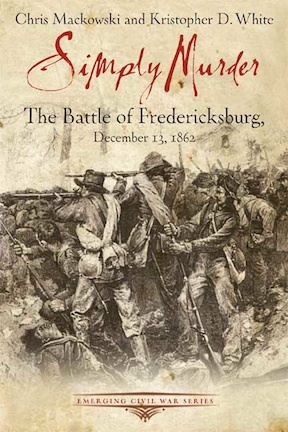 In Simply Murder: The Battle of Fredericksburg, December 13, 1862, they not only recount Fredericksburg’s tragic story of slaughter, they also share information about the battlefield itself and the insights they’ve learned from years of walking the ground. Simply Murder can be enjoyed in the comfort of a reader’s own living room or taken out as a guide onto the battlefield itself. It is part of the new Emerging Civil War Series which offers compelling, easy-to-read overviews of some of the American Civil War’s most important stories. Each volume features masterful storytelling richly enhanced with hundreds of photos, illustrations, and maps. About the Authors: Chris Mackowski is a professor in the School of Journalism and Mass Communication at St. Bonaventure University in Allegany, New York, and also works with the National Park Service at Fredericksburg & Spotsylvania National Military Park, which includes the Fredericksburg, Chancellorsville, Wilderness, and Spotsylvania battlefields. Kristopher D. White is a historian for the Penn-Trafford Recreation Board and a continuing education instructor for the Community College of Allegheny County near Pittsburgh, Pennsylvania. He served for five years as a staff military historian at Fredericksburg & Spotsylvania National Military Park, and is a Licensed Battlefield Guide at Gettysburg. Longtime friends, Mackowski and White have co-authored several books and numerous articles for various Civil War magazines. Read their blog: www.emergingcivilwar.com.